Common elements from the natural environment, such as a hen and chickens, rail fences, trees, flowers, and even windmills inspired many quilters. 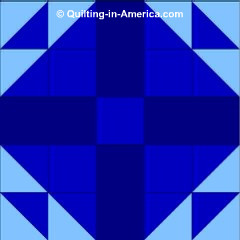 With dozens of colorful squares, triangles, and other geometric shapes spread around them, many abstractions of their everyday lives must have come to mind while they decided how to join them together into quilt tops. 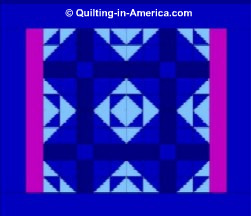 Occasionally seen in Amish quilts, Hen and Chickens, or Hen n Chicks, is a very simple block design made up of half-square triangles, squares, and rectangles. When made with strongly contrasting colors within the block, then joining the blocks without sashing, the boundaries of each block are lost in the design, fooling the viewer.